His title? International DJ, man of mystery. Jaguar Skills should need little introduction. He’s the country’s best-known mash-up DJ, who rose to fame creating themed minimixes for Chris Moyles’ BBC Radio 1 Breakfast Show. Some might turn their noses up at that – but anyone who manages to get quality hip-hop, house, electro, dubstep, D&B and so on national breakfast radio is alright with us. Now a fully-fledged part of the Radio 1 family, he regular delivers spellbinding, fast-paced mixes which are packed full of his own unique bootleg / mash-up concoctions, and can be anything from a history lesson to a bit of themed, humorous fun. Honing his craft and love of music for the last 15 years, Jaguar Skills has remained true to his school and kept a mysterious edge to his character; with details of his real name, age etc remaining unconfirmed. 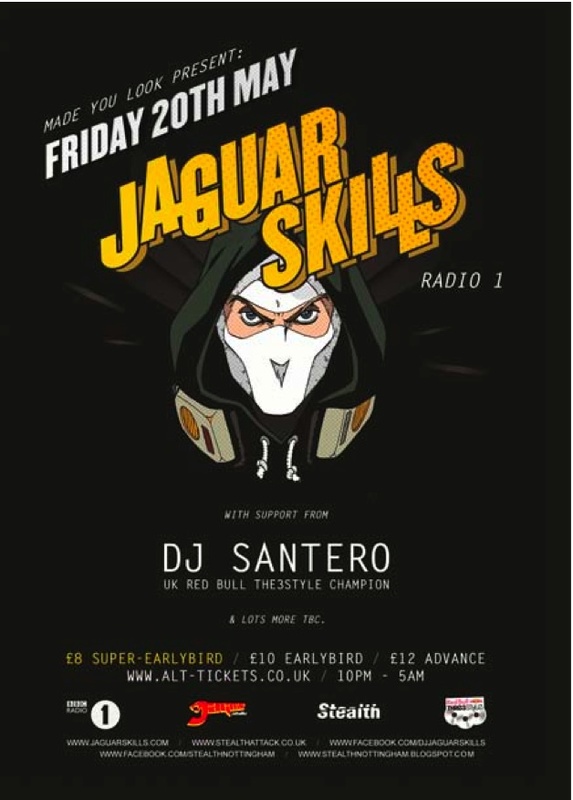 After rocking clubs & festivals the world over, we are looking forward to welcoming back Jaguar Skills to Stealth! Support comes from SANTERO, Made You Look DJs and lots more! Very Limited Earlybird tickets available NOW from Alt-Tickets.